When I do whipped cream cakes, my decorations have always been very basic and simple. Thus I hardly ever use coupler although I have them in 2 sizes. This is usually how I do mine (I do think this is not a new thing though). 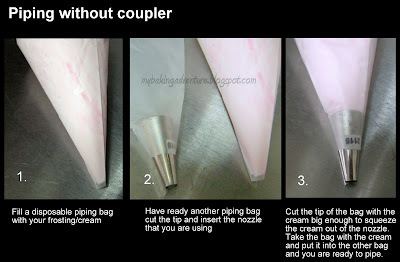 You can see that this method uses more piping bags, but I like it because it also makes the cleaning of the tip easier. To change tip, just remove the outer bag, change the nozzle, put it back again and you are ready to pipe again. I got this tip watching one cooking show at one Indonesia channel and find it useful so now I am sharing it with you. Thanks for sharing this. I learnt something that is new to me and am sure it helps. :). I like the piping bag technique. Will certainly try it the next time I make cream puffs. Thanks for sharing Zurynee! Thanks so much I was trying to figure this out!